The rotator cuff is made up of four different muscles and tendons near the shoulder joint, including the subscapularis, the supraspinatus, the infraspinatus, and the teres minor. Together, the tendons and muscles help to support the joint, promote fluid arm movement, and enable full range of motion. 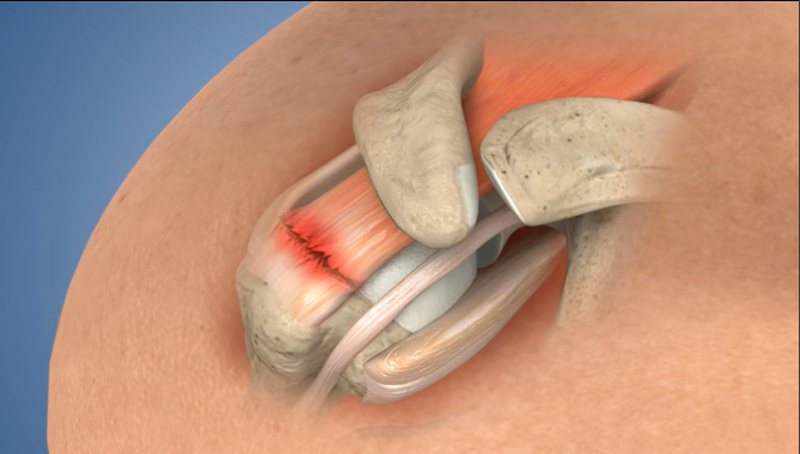 There is also a fluid-filled sac in the joint called a bursa that protects the cuff and tendons during arm movement. A torn rotator cuff can cause pain or loss of mobility in your shoulder. If the tear is severe enough, surgery may be necessary to repair the damage. What causes tears in the rotator cuff? Cumulative injury, which is the result of repeated use. This is most common in athletes who perform many throwing motions, like in baseball or football, or frequent weightlifting. Acute injury, resulting from a fall or other sudden action that results in impact or stress to the shoulder area. Cuffs can be partially or fully torn in an injury. They involve different treatments, so please see our other page about partially torn rotator cuffs for more information about those treatment options. Heiden Orthopedics most commonly performs the arthroscopic repair procedure because it requires smaller incisions, typically resulting in faster recovery time than the other procedures. You will be given anesthesia for your comfort during the procedure. One or two incisions will be made in the shoulder area and a small tube, called a cannula, will be inserted to better access the joint. Saline solution will be injected into the joint to expand the area and allow for more visibility during the procedure. A tiny camera and surgical instruments can be inserted through the cannula. Scarred or severely injured tissue on your torn tendon will be removed. Anchors are placed in the bone and attached to the remaining healthy tissue. The anchors will hold the tendon in place against the humerus. Your incisions will then be closed, after which most patients are able to return home the same day. Some swelling and pain can follow surgery, but will diminish with time. You will be prescribed pain medication to ease your symptoms during the first few days. You will have aftercare instructions that include performing certain exercises and stretches to help you build strength in the joint and maintain mobility. Recovery time can vary based on the severity of your injury, the extent of your surgery, and your individual healing time, but you can generally expect to be fully healed after four to six months. Once recovered, you should have a significantly better range of motion and a dramatic reduction in pain and discomfort. Most patients are very satisfied with their results, and can regain lost function in their shoulder with the help of Heiden Orthopedics. If only I had three feet, I would get to see Dr. Dickerson and Lindsay again! Honestly, who knew that bunion surgery could be so easy! I looked forward to my weekly visits and am so thankful to have had such great care. Dr. Dickerson is kind and exceptionally professional. Have referred at least two friends and will keep doing so.